Knoco stories: Where is the best place to store knowledge? Where is the best place to store knowledge? 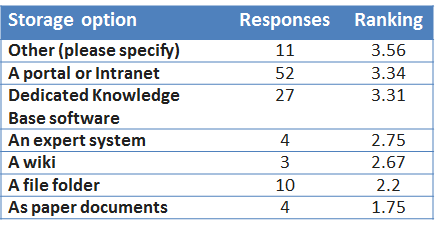 As part of our 2014 global Knowledge Management survey, we tested where people store knowledge, and how effective that store is. The table below shows where people who answered the survey store their Best Practices, and the satisfaction rating (marks out of 5) for that technology choice. The responses suggest that the best option is a home-grown "Other" system, and that second best is a portal or other dedicated software. File Folders was a poorly ranked solution. 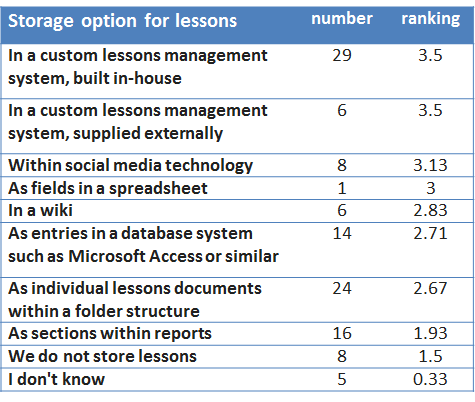 The table below shows where people who answered the survey store their Lessons Learned, and the satisfaction rating (marks out of 5) for that technology choice. 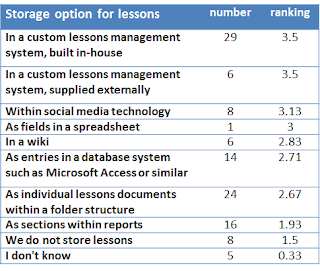 The responses suggest that the best option is a home-grown or purchased Lessons Management System. Leaving lessons as sections within reports was rated as one of the worst solutions.